Lil Durk will be dropping his new album tomorrow. He dropped two new tracks this week, “India Part II” on Tuesday, and just today, “Play With Us” featuring Kevin Gates. 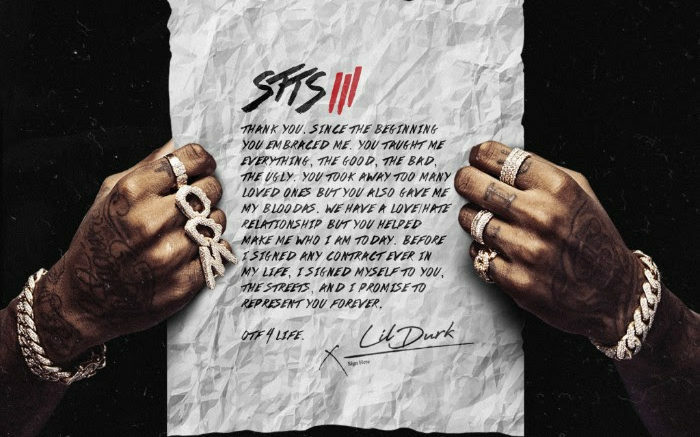 Signed to the Streets 3 will be Lil Durk’s first project on Alamo/Interscope and the third in a series that’s taken him 4 years to release. Lil Durk’s combination of emotional realness and soaring melody makes him one of the most consistent hitmakers in rap. Since the first Signed To The Streets release in 2013, Lil Durk has kicked lean, became a pescatarian, is in love with his gf India Love Westbrooks (they had just a baby girl last week) and moved to the suburbs of ATL. On the business side of things, he parted ways with Def Jam, secured a new bag from Alamo, and bossed up by launching his own label imprint, Only The Family. Be the first to comment on "Lil Durk “Play With Us” ft. Kevin Gates"